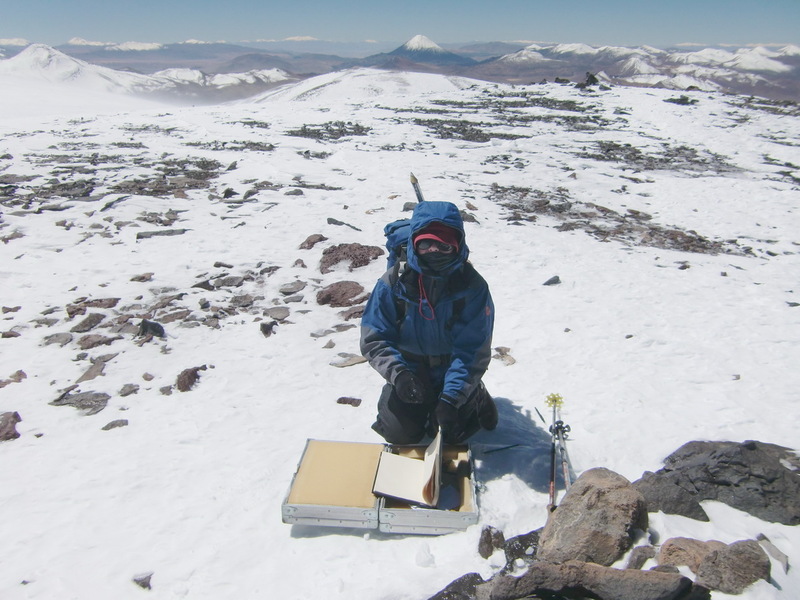 Cerro San Francisco is with 6018 meter high probably the easiest 6000er of our world, both access and ascent. 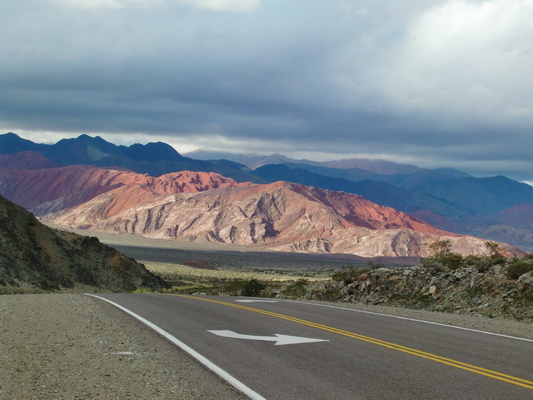 It is situated on the border between Argentina and Chile and closed to the Paso San Francisco, which is with 4753 meters one of the highest pass in the Andes. This pass has the highest density of 6000er on earth outside of the Himalayas. 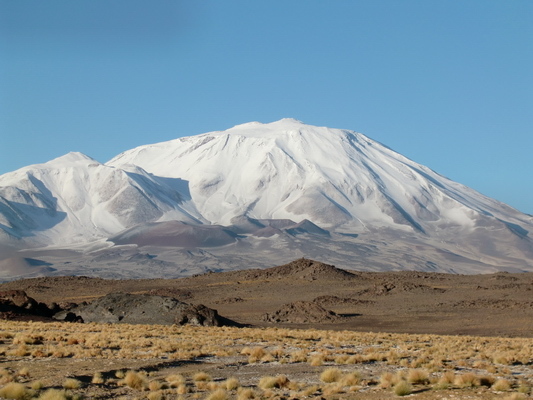 Five of the ten tallest peaks of the Andes are closed to it, including Ojos de Salado which is the second after Aconcagua. We started our trip to the Paso San Francisco in Fiambala, which is the last bigger settlement on the Argentine side, more than 3000 vertical meters below. Fiambala is a pleasant village with all facilities like Internet and famous thermal springs. It is also one of the major points of the rally Paris Dakar, which had passed Fiambala few weeks before we were there. 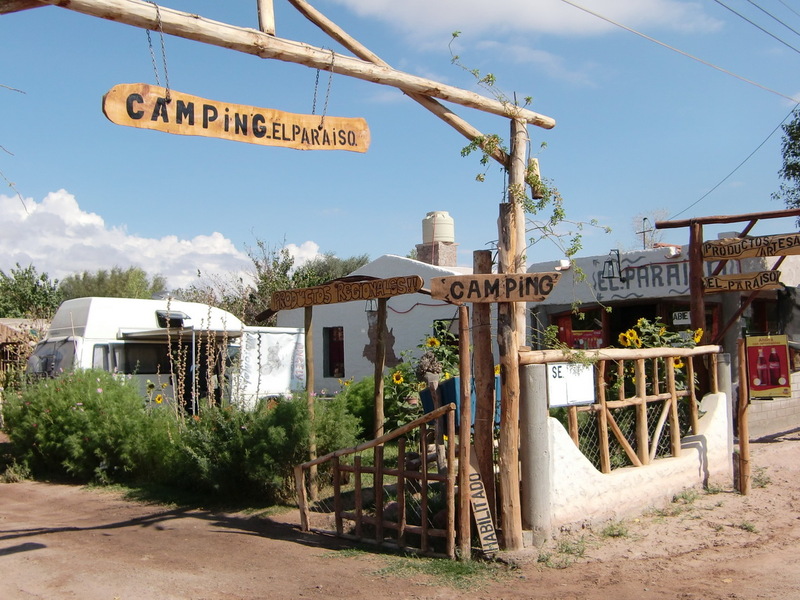 We found the paradise in Fiambala, one of the nicest camping places in Argentina so far (GPS coordinates: S27° 41.249' W67° 37.452'). 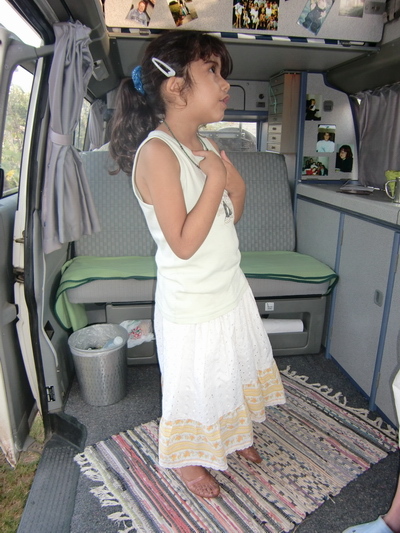 And we had suddenly a granddaughter: The 6 year old girl Chirli from the owner of the camping place came to our camping car and felt at home. We played and laughed a lot with her, we exercised Spanish, we cooked several meals and she did the dish washing! The only problem was that we had not enough meat - Chirli is a true Argentine girl. Consequently she grabbed always a big piece of meat from her parents before we ate our meal. We had so much fun with Chirli that we stayed three days in Fiambala, much longer than we had intended. Thanks a lot Chirli. Due to some rain in the mountains we had less luck with the thermal springs. They are located 20 kilometers East of Fiambala and you have to cross a small stream. 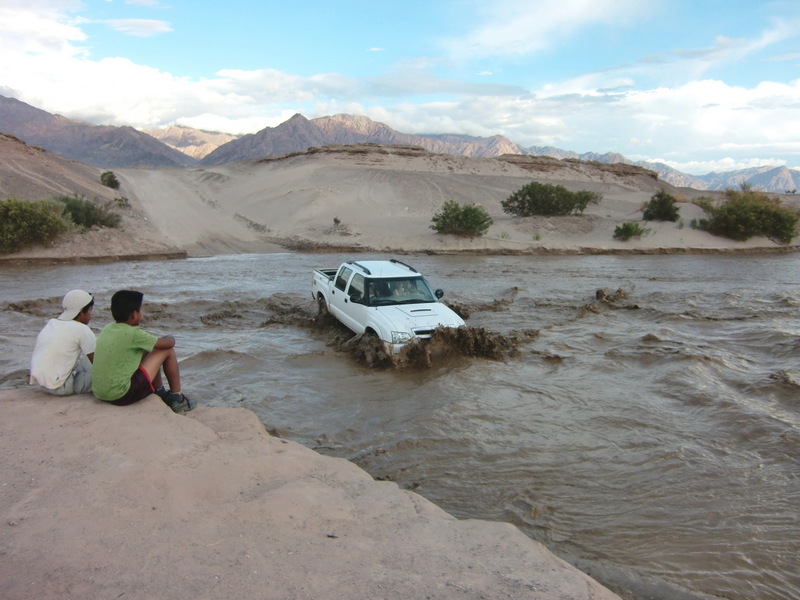 This little creek was now a big and wrenching river - impassable with our car! The road from Fiambala to the Paso San Francisco is in a very good shape, it is completely paved and it has six security huts with urgency phones on its way. 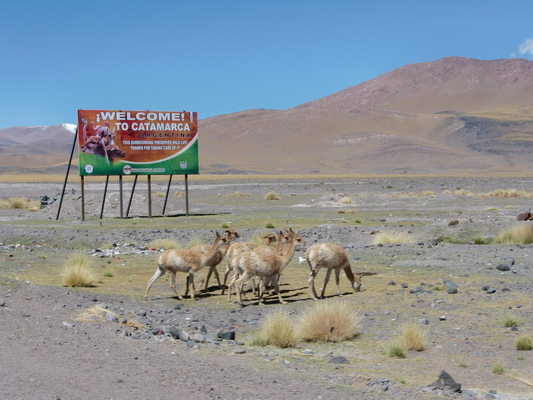 We passed a pristine, colorful and marvelous landscape with a lot of animals like wild donkeys, vicunas and foxes. 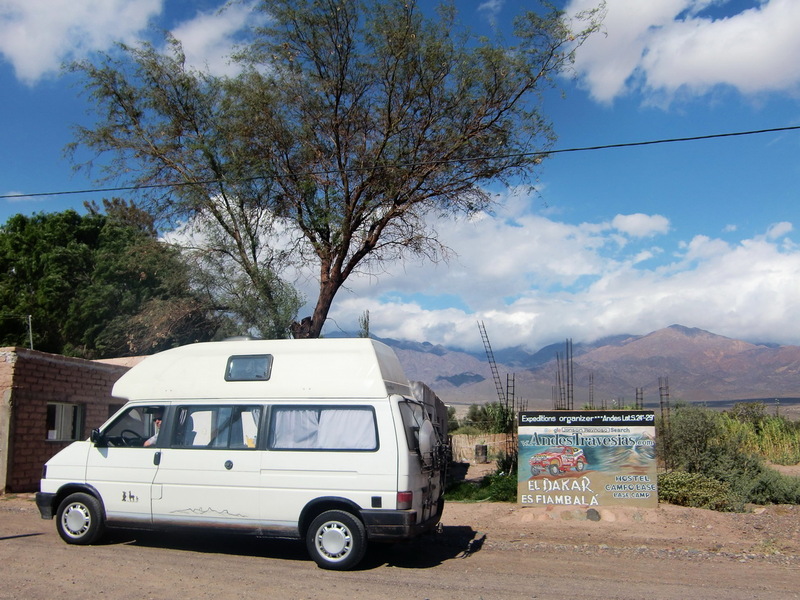 To acclimatize properly we stayed five days at the Termas Las Grutas (GPS coordinates: S26° 55.383' W68° 08.784'), which are more than 4000 meters high and which are 2 kilometers away from the main street. They are in perfect and very clean conditions with roof and all other facilities to enjoy the warm (approximately 35°Celsius) water. 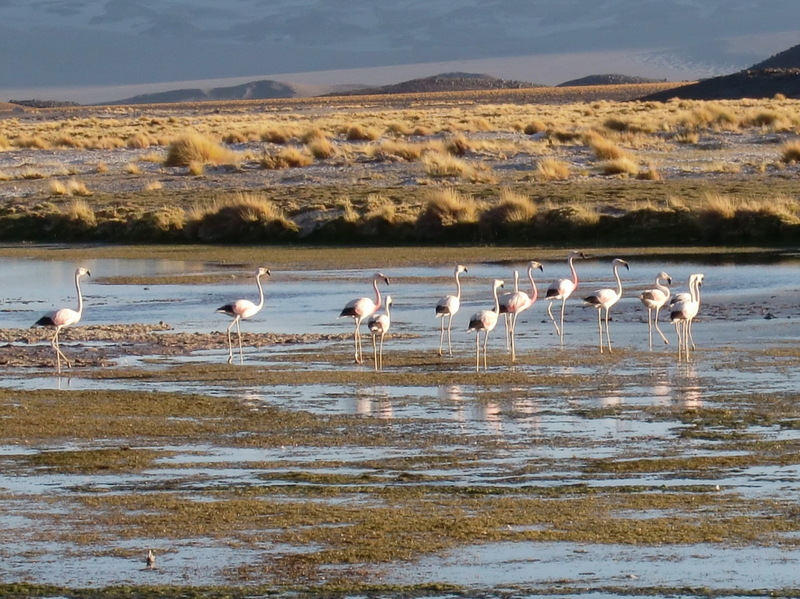 Behind the Termas Las Grutas is the salty lake Laguna San Francisco with unbelievable many birds, vicunas, wild donkeys and horses. Its water has a very special color between green, grey and blue. Our first mountain tour was the 5254 meters high Volcan Bertrand, which is on the opposite (North) side of the main street. It is a long, endless hike over not very steep slopes, but the views from the summit are excellent and stunning. It was also a little bit difficult to find the highest point, because there are a lot of volcanic cones on a flat plateau. We started our hike few kilometers west the main street (GPS coordinates: S26° 52.151' W68° 14.036', summit: S26 50.615 W68 11.489). In general there was tremendous much snow on these mountains, thanks to the bad weather few days ago. Usually these mountains are just covered with little snow, ice and glaciers on the top south sides. 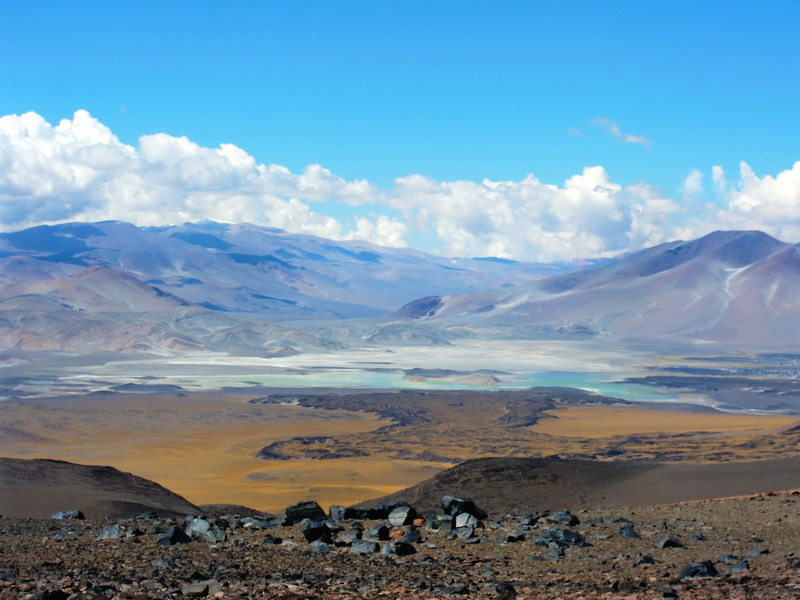 Our next destination was the 6018 meters high Cerro San Francisco on March 12th 2011. The hiking starts few hundred meters south of the Paso San Francisco (GPS coordinates: S26° 52.966' W68° 17.795'). It is so popular that a big track leads to its summit, clearly visible from the pass. 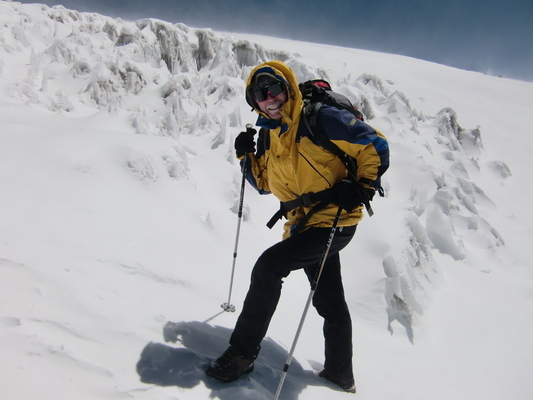 Usually no crampons and ice axe is required. But the mountain was so white, that we took it with us. And we had to pass one very icy gully, so it was no luxury! First we hiked to the relatively steep North slope which we crossed from West to South. A flat, long and exhausting plateau which deep snow led us to the saddle between the higher West and East summits. Fortunately a group of Austrians were on the mountain the previous day, so we had a solid track. 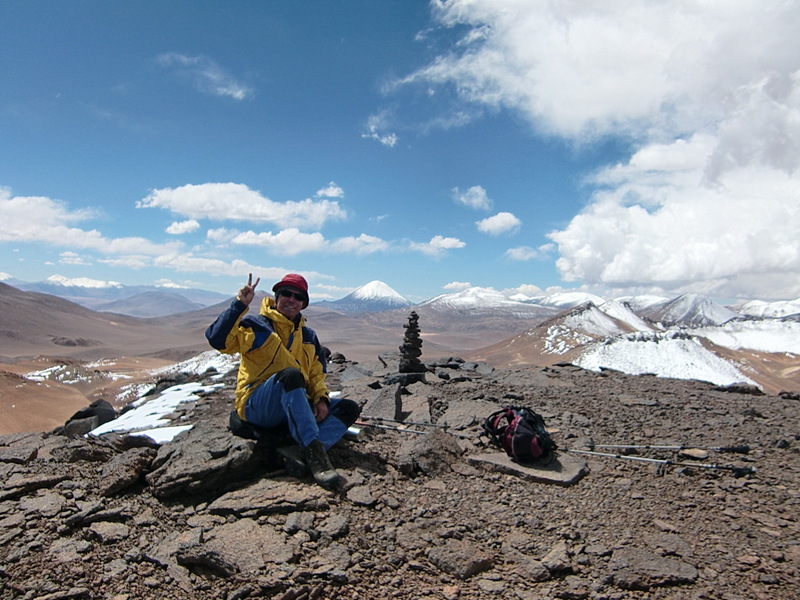 Finally after 7.5 hours we achieved the summit at 3:00PM (GPS coordinates: S26° 55.178' W68° 15.743'). The descent was much faster than the ascent thanks to the snow and scree. The second highlight of the day was the Grutas Las Termas, incredible good! 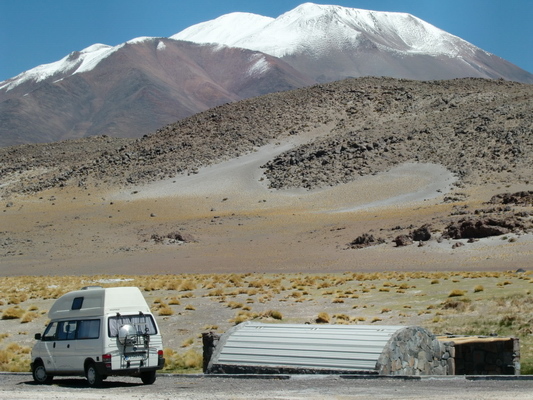 20 kilometers behind of the Termas las Grutas is the base camp of the Cerro Incahuasi, which is one of the most interesting peaks of the Andes. Incahuashi means "house of the Inca" and on its top, 6621 meters high, are ruins from the Incas. It is the second highest archeological site of the world. 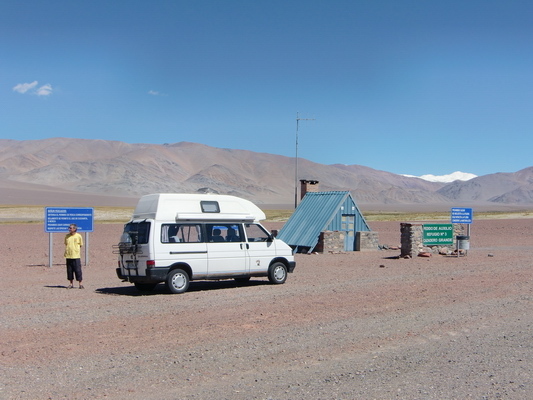 Besides that the dirty road to the base camp was in an acceptable shape, so we could drive it with our car. But there was so much snow that an ascent was more or less impossible for us. We met two US citizens returning from the Incahuashi. They were a little bit frustrated because they had been stuck in the more than one meter deep snow more already at 5200 meters. 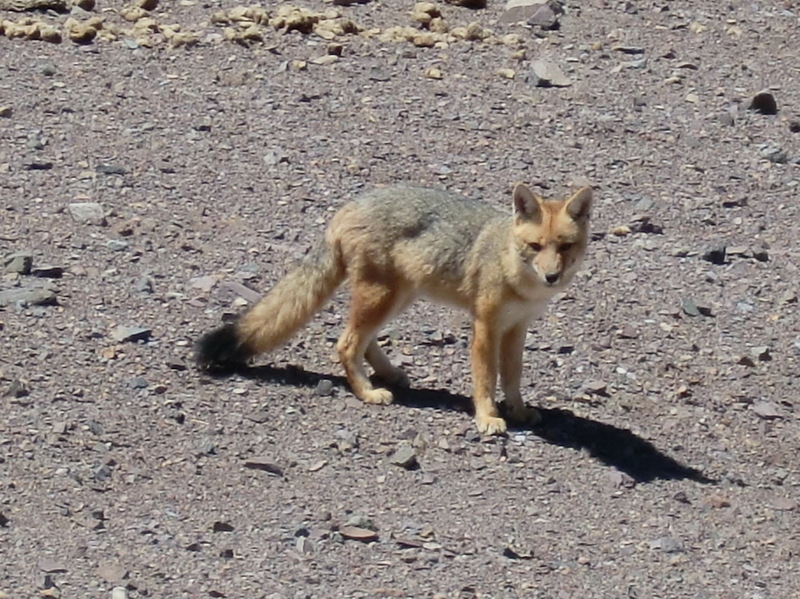 Consequently we skipped Incahuashi (this time?) and drove to Chile. Viel Spass & Take care!